Movie: "Phantom of the Paradise"
An evil record producer steals the music of the talented composer he tried to eliminate so he can use it open his new club 'The Paradise.' Thought to be dead, the composer returns as a phantom who will get vengeance at any cost. Rock operas were all the rage in the 1970's. 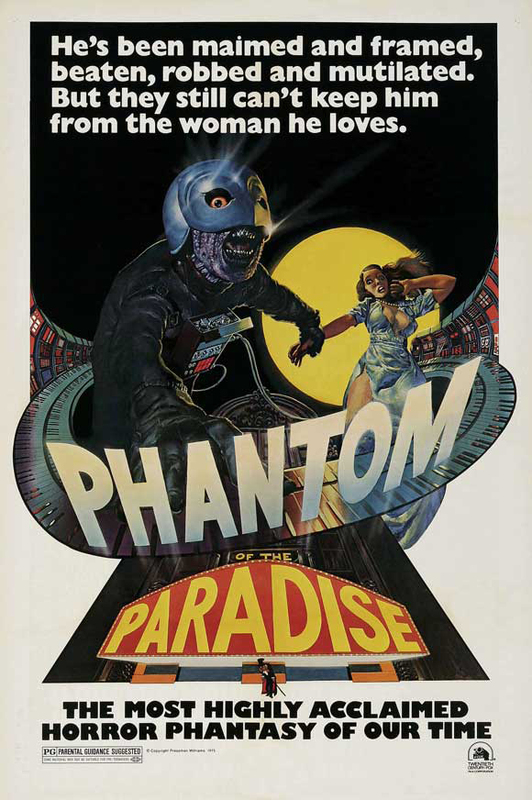 We've seen numerous films in this genre released from that decade, and "Phantom of the Paradise" is one of the...best?...craziest?...wackiest?...of them all. It is written and directed by Brian De Palma, who would go on to direct films like "Carrie," "Scarface," and "The Untouchables," though his writing credits aren't nearly as impressive. The film centers around a music composer named Winslow (William Finley), who is creating his rock cantata version of "Faust." An evil record producer named Swan (Paul Williams) steals the cantata, frames Winslow, and seemingly has him killed. Swan wants the music to open his new club called The Paradise, but he wants the credit all for himself. When Swan tries to open the club, a phantom shows up to make sure it doesn't happen unless things are done his way. This is a very bizarre movie in that it is a comedic horror retelling of "The Phantom of the Opera" with elements mixed in from "Faust." It's an odd idea, but it sort of works? As far as this being fully considered a rock opera or a musical, it's a bit borderline since the majority of the musical offerings are isolated to on-stage performances. Since the movie and the music are based on "Faust," they mostly still drive the narrative. As for the music, it's fine at the moment, but none of it is all that memorable outside of the film. As we write this review, it's difficult for us to conjure up even one tune or lyric from any songs in the movie. The story itself is bizarre and has its funny moments, though these instances are only humorous due to the absolutely absurd nature of the story. Much of the acting, especially the performance of William Finley, is waaaaaay over the top (though intentionally so). His showy performance will make you laugh and will have you enjoying yourself while watching this quirky film. The sets are interesting and very of the era, reminiscent of a psychedelic disco. It is wild to look at, and we have to wonder what the filmmakers were ingesting, smoking, shooting, and/or drinking when they made this trippy movie. As weird as "Phantom of the Paradise" is, we are still able to see a clear narrative and feel like you should do yourself the honor of watching such an entertaining, eccentric movie at least once in your life.